Note: As reported at 3:45 PM there was a “hopeful” clearing in Ohio and the possibility of enough clear sky to merit opening the Wagman Observatory for tonight’s Star Party. Obviously there could be a change for the better or worse. Were there to be rain or advancing adverse conditions it would not bode well for the continuance of star party plans. Feel free to check back here and AAAP Facebook or phone the observatory, 724-224-2510 for updates. The Saturday, November 4, Wagman Star Party starting about 6:20 PM EDT not 6:25 as previously reported. Enjoy the views of large clusters of stars, beautiful colored double stars, visit the craters of the Full Moon and view the planets Saturn, Uranus and Neptune through the telescopes at the Observatory and much more. This star party falls on the night of the November Full Moon: 1:22 AM EDT Full; November 4, 2017 Moonrise occurs at 7:02 PM EDT; Moonset 8:17 AM EST on Sunday, November 5, 2017. Times for Pittsburgh, PA from www.timeanddate.com. Daylight saving time 2017 in Pennsylvania began at 2:00 AM on Sunday, March 12 and ends at 2:00 AM on Sunday, November 5. 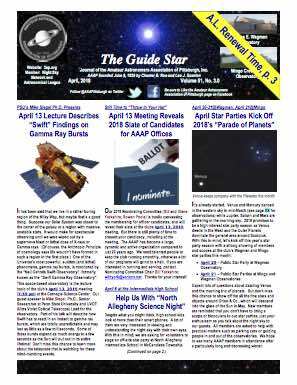 The November 4 Wagman Star Party concludes the Wagman 2017 Star Party Season. Next year’s dates are listed at the end of this post and on the website . AAAP will hold one more 2017 Observatory Star Party following the November 4, at Wagman Observatory on November 11 at Mingo Observatory.